Haiti rejects US Ambassador Pamela White’s “too little too late” attempt to save the corrupt Martelly-Lamothe Regime.Haiti Message to US Ambassador Pamela White, Sandra Honore and Barack Obama/Bill Clinton: Stop Blocking Removal of Corrupt Martelly-Lamothe Regime | Bloodshed continues as militarized Haiti police kills 3-month old baby with tear gas, wounds four protestors. Top photo: US Ambassador Pamela White with Pres. 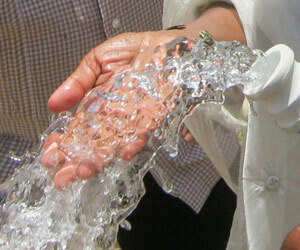 Martelly, drink-in-hand at beach. Bottom photos: Amb.White hugging on Prime Minister Lamothe. 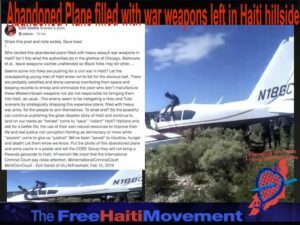 US/Pamela White’s close relationship with Haiti corruption is a hot Haiti media topic. In a letter dated November 28, 2014, the United States Ambassador to Haiti, Pamela White commanded a close-door meeting at the Fusion political party headquarters with the six opposition parties who are demanding an end to the US-supported Martelly-Lamothe regime and its harmful, pro-imperialist and unrestrained neoliberal economic policies in Haiti. Fanmi Lavalas and Kontra Pèp La did not attend the meeting with US ambassador Pamela White. The four others – MOPOD, Fusion, Ayisyen Pou Ayiti, INITE – met with the US Ambassador at Fusion headquarters at the appointed December 2nd time at 4pm. 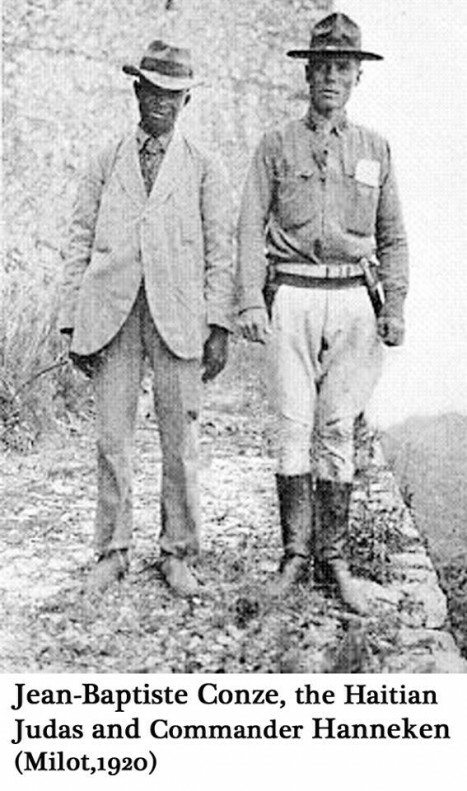 During First US occupation of Haiti (1915-1934), the traitor, Jean-Baptiste Conze betrayed Charlemagne Peralte, Leader of armed warriors against invading US Marine imperialism. 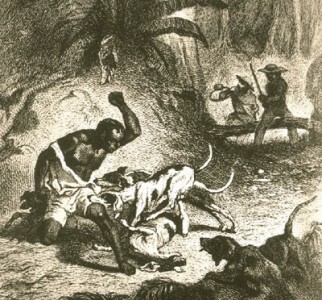 Hanneken captured Peralte, terrorized, murdered and nailed his corpse to a door the Marines hung at the public square in Cap Haitian, Haiti. A large protest crowd in front of the Fusion headquarters made it difficult for the US ambassador and her convoy to easily past without facing and hearing the demands of the people to take Martelly back to the US with her. There were many shouting “Go home USA, Go home Pamela White.” Other extraordinary demands by the streets were in the signs which begged Russia for help against the US occupation. There are reports of signs: “Vladimir Putin please help us, Haiti.” A sign where Vladimir is boxing with Obama read: “Vladimir Putin help us with Obama’s regime in Haiti!” These signs were waved at the US Ambassador. Throughout Haiti, tens of thousands of Haitians are holding anti-government protest rallies. As the January 12th date for dissolution of Parliament approaches with no realistic plans for new parliamentary elections in the works, the tense encounter is viewed as the US Ambassador’s “too little too late” attempt to save the corrupt Martelly-Lamothe regime. 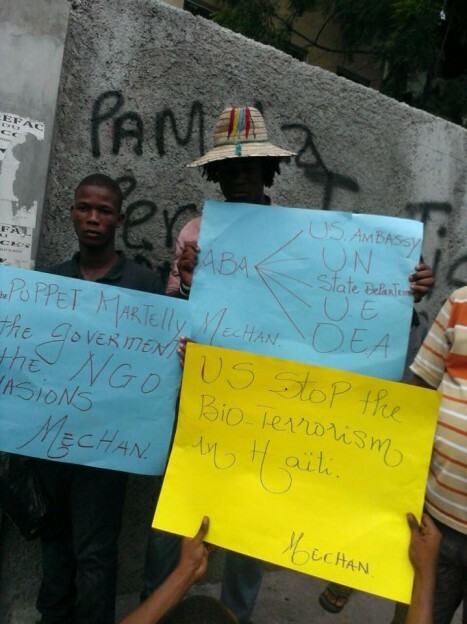 The demonstrators’ demands of the US Ambassador Pamela White, the UN-MINUSTAH head and spokesperson Sandra Honore, President Barack Obama and former UN envoy to Haiti, Bill Clinton is that they stop blocking: fair and honest elections. Stop blocking the people’s removal of the corrupt Martelly-Lamothe regime from Haiti. 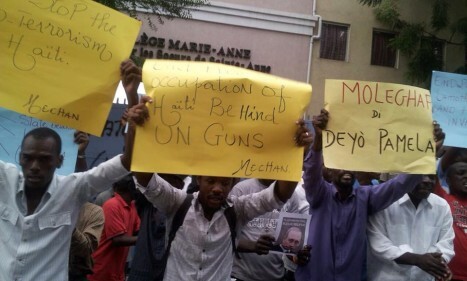 Most in the crowd outside were protesting the four political parties, who agreed to meet with the US Ambassador, calling them collaborators with the big powers and denouncing any agreement these political parties might take to retain the Martelly-Lamothe regime. They said the “Conzes meeting with the imperialist forces will not be negotiating on the back of the people on the streets.” The militants on the streets said the people won’t easily be ignored or betrayed by the political parties who accepted to meet with US Ambassador Pamela White. The spokespeople on the streets denounced any negotiations of all the four political parties who attended the meeting. This was the first time, in the three years since the imposition of the US Martelly-Lamothe regime that the US expressed any interest in the voices of the people in the streets for participatory democracy or in sitting down with the anti-Martelly-Lamothe political sectors in Haiti. Go Home USA, Go Home Pamela White- MECHAN: Mouvman Etidyan pou Chanjman (Student Movement for Change). The people on the streets indicated to the four parties who attended the US meeting, that no matter what they say, the people do not trust them not to work over their heads with the imperial powers. Nonetheless, here are the points, so far, made by the head of MOPOD, representing to the public what happened at the meeting between the four parties and the US highest representative in Haiti. without the participation of the people of Haiti. 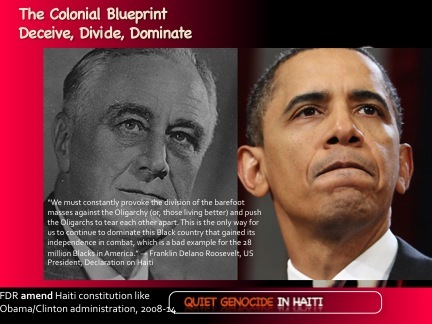 for determining, quantifying a Haiti resolution. population in prison, the population participation. Throughout Haiti, the anti-government protests are rising. Haiti National Police reportedly also fired tear gas to disperse protesters who also blocked hundreds of workers from entering the Codevi Industrial Free Zone in Ouanaminthe, owned by Dominican businessman Fernando Capellan. Frustrated and angry Haitian villagers near the border with the Dominican Republic, like Haitians throughout Haiti are demanding that Michell Martelly’s regime stop flying to foreign capitals and spending State monies on luxury hotel tours and attend to the social needs of the people of Haiti such as providing safe and affordable housing, clean drinking water, sanitation, health care, energy/electricity, local agricultural investment, street and road repairs among Haiti domestic needs. 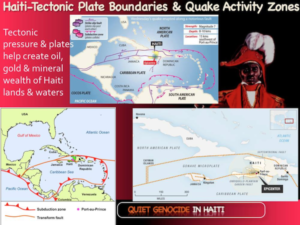 For more critical Haiti commentary on the current situation in Haiti, count on the Ezili Network/Free Haiti Movement. 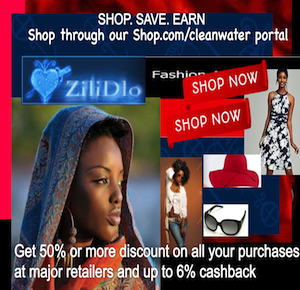 – An end to unfair US-Euro trade in Haiti and the NGO invasion that’s mostly humanitarian imperialism. 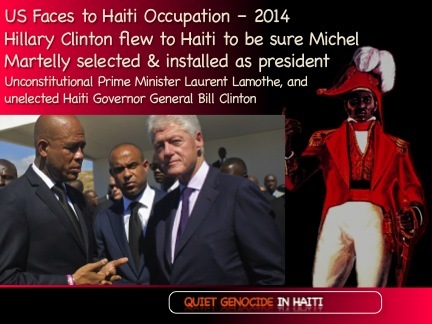 – An accounting of the Haiti Interim “Hillary and Billy” Reconstruction funds, collected in the name of suffering Haitians. Ezili interview on Black Agenda Report weekly radio broadcast with Glen Ford plus interview with Cornel West and Bob Avakian Dialogue at Riverside Church, published by BAR, Nov. 26, 2014. Ten of thousands of Haitians demonstrated in the Haitian capital of Port-au-Prince and throughout Haiti said Ezili Dantò. 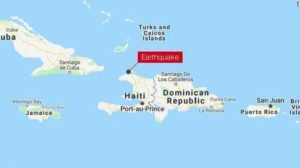 A mob of angry Haitians on Monday attacked the Dominican Consulate building in Ouanaminthe, northeast Haiti, which prompted the evacuation of the staff. The rioters pelted the consulate’s windows and staged protests by torching tires nearby. Haiti National Police reportedly fired tear gas to disperse protesters who also blocked the hundreds of workers from entering the Codevi Industrial Free Zone in Ouanaminthe, owned by Dominican businessman Fernando Capellan. 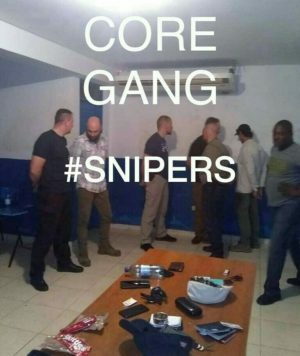 Outlet listin.com.do reports that the riots continue in Haitian villages near the border with the Dominican Republic, on demands that Michell Martelly’s administration attend social needs such as drinking water, energy, street and roads repairs among others. On Monday the cross-border market reopened after being shuttered last Friday on protests staged by Haitians in several towns, to demand that Port-au-Prince lower the taxes levied on products imported from Dominican territory. ont été blessées par balles. suivant divers témoignages recueillis par des correspondants de presse. ce lundi 1er décembre 2014.
manifestants dans la zone de Fort Liberté et de Ouanaminthe. lors de manifestations, depuis plusieurs jours, Ã Fort Liberté. nationale (Cspn) sur les événements en cours dans le Nord-Est d”HaÃ¯ti. l”occasion, sur le territoire d”HaÃ¯ti. informations font état d”affrontements entre groupes rivaux. divers quartiers de la municipalité de Cité Soleil.